Ian helps out at the December meeting. December 14, 2005: We set up some tables and invited members to set up their own Macs for a little one-to-one assistance in problem solving, troubleshooting, and software upgrades. The more experienced members answered questions and shared their expertise. We had a fun time with this kind of meeting, and we’ll probably do it again! 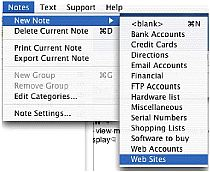 November 17, 2005: Dirk Reynolds showed us what’s new in Filemaker Pro 8. There’s more than one kind of FMP-8: Pro, Pro Advanced, Server Advanced, Mobile for hand-held devices, and Ready-Made Solutions with templates that don’t need programming. The Ready-Made version is a good choice for hobbyists who want to make a database of their music collections or postage stamps, for home budgets, or for a database for a non-profit organization. Templates are customizable, and a free 30-day trial version is available for download. Business users can run their entire business on FMP-8, including inventory, contacts and automated e-mail newsletters, and FMP-8 is cross-platform compatible with Macintosh, Windows, and the web. October 12, 2005: Robert Winokur showed how to take better pictures, and Robert DeLaurentis showed how to edit them better. Below: camping in the Mendocino Woodlands. A panorama made from two wide-angle shots. Notice how the scene is framed by the trees at the extreme left and right; the image has enough of the surroundings to show what it was like to be there. 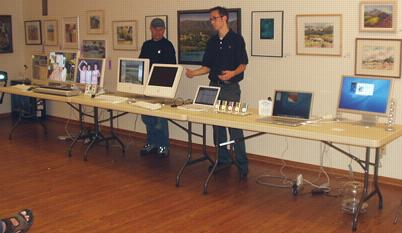 September 21, 2005: Andrew Heuchert, the Apple rep at CompUSA, and Mike Bishop of The Mac Mechanic showed us what’s new in Macs and Mac accessories. Among them were the new iPod Nano, the iTunes-enabled Rokr phone, new software, and a portable iPod speaker system. Mike and Andrew with the new stuff. Ian’s view of iChat with Dirk. Ian sees himself (lower left), Dirk’s camera is pointed at the audience. 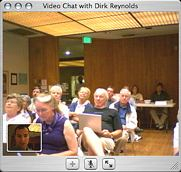 August 18, 2005: This month’s meeting was about communicating with e-mail, with Internet chat, and by telephone over the Internet. Everyone at the meeting was using e-mail, so no explanations of the basics were necessary. But Dirk showed us some cool features in Apple’s software: When replying to a message, select the text you want to reply to, then click Reply. Mail will open a new message window with only the selected text ready for your reply. Want to attach images? Go to iPhoto, select images to attach to a message, click the Email button, then select image size. If the recipient is using Mail, they will see the images in a column below the text. But Mail can also display them as a slide show, at full screen or actual size, or an overview of all the images at once. Before sending images, be sure to reduce them to appropriate sizes for easy viewing, and keep the file sizes small for easy downloading for people with dial-up connections. There are various Internet chat services – AOL, Microsoft and Yahoo arae the biggest, but they are not all compatible with each other. Apple’s iChat is compatible with AIM (AOL Instant Messaging) and Jabber. If you don’t have AOL or iChat you can get an AIM account for free at AIM.com. Some iChat users have audio and video as well, so they can talk and see each other instead of typing. This requires Mac OS X Panther (version 10.3) or later, and an iSight or other FireWire camera; a USB headset microphone works better for speech than the Mac’s built-in microphone. You can use iChat with Windows users too, but see MVL Design’s Video Conference Tutorial for iChat and AIM for details on making it work. You can make phone calls over the Internet and save on long-distance charges using VoIP (Voice over Internet Protocol). This requires a VoIP service such as Vonage or Lingo. Dirk uses Skype, a new VoIP provider in England. Their service is free for calls from Skype accounts to other Skype accounts; Dirk reports the cost for other connections as about 11/2 cents per minute, anywhere in the world, payable through PayPal. Conference calls are possible too, and computer-to-phone as well as phone-to-computer calls. VoIP phones and headsets are available as well. For more about VoIP, see How VoIP Works on HowStuffWorks, or search Google for “VoIP” or “ip-telephony”. Thanks to Mike Bishop and the MacMechanic for the multi-button Mighty Mouse given away in the drawing! After the show, John gave us some tips on using iPhoto and doing slide shows. We enjoyed his presentation a lot. John brought the show on an NTSC DVD, so it could be played on a TV as well as a computer. John also brought a CD of the sound of the goats’ bells, which we gave away as the prize for the drawing. June 16, 2005: Jim Tinsley presented this month’s “cool stuff”: Want to know whether a flight will be on time? Take a look at Airwise Flight Arrivals Information, where you can select an airline, specify a flight number, and see an up-to-the-minute map showing the location of the plane and the status of the flight. Next, Ed Togami showed us where to get free (and legal) downloads of music, and how to save them to disk. You don’t necessarily need the latest stuff — Ed used the Jaguar version of OS X (10.2.8). #1. First, you need to set QuickTime preferences to save movies to disk cache. #2. When you click a link to play a file and it opens in QuickTime Player, select Save from the File menu. (If the name has an audio file name extension at the end, that’s the music file. If not, try saving with the freeware utility iGetMovies, available from Version Tracker. Note: version 2.1.1 doesn’t work with QuickTime 7.) #3. Double-click the saved file and it opens in iTunes! In some cases, song info automatically imports into iTunes with the music. #4. Then Get Info on the tune, click “Artwork”, and on the download page copy the cover art image to the clipboard. #5. Voilá! MP3s are available at Amazon.com (free registration required). Click the “Music” link, then “Free Downloads”, then click “Browse Digital Music” to see the available genres or use the search feature. You won’t find everything for free, but you can make serendipitous free finds within genres. It’s a good place to find unknown performers showcasing their new recordings. Song info, and sometimes lyrics, can also be found along with album artwork. Got kids? Free Kids Music has plenty of amusements for young listeners. For example, “There’s a Cow Parked in the Driveway”! Burn your kids’ favorites to a CD and take it with you to play on trips. Those interested in American history will find hundreds of historical speeches and transcripts at American Rhetoric (not all are free). Last but not least, Internet Archive will delight fans of The Grateful Dead. Here is a massive archive of music, video, and web pages going back years. Remember a Dead concert you heard in the 1970s? You might find it here! Wednesday, May 18, 2005: We began with a look at this month’s “cool stuff”, the on-line encyclopedias Answers.com and Wikipedia. Dirk (left) and Andrew (kneeling) get set up to show Tiger at the May meeting. iChat AV can display up to 4 images for video conferences, up to 9 people in an audio conference, and is compatible with AIM (AOL Instant Messenger). April 21, 2005: We began with some “cool stuff”: a look at Google Maps. Plenty of categories to save your notes in. The main presentation was all about organizing your thoughts! James Lee of Tropical Software came by to demo their flagship product, TopXNotes™. March 17, 2005: Brian Carlin and Ian Lessing demonstrated lots of useful techniques for Mac OS X users. Brian sends music across the room with AirTunes, as Ian watches from the corner. #10. Ian showed how to use Keychain for optimum convenience and security for passwords on many web sites. It’s a good idea to change the Keychain password so it’s not the same as the System password. #11. Becky Davis suggested using different passwords for each web site where highest security is needed, and one password for web sites you only need to log into. Use passwords you can remember but no one would guess, like initials from the title of your favorite book, with numbers added. #12. Always make a backup copy of your Keychain file! #13. Keychain First Aid checks the Keychain and offers to fix any corrupted passwords for you. (You have to reenter the password.) #14. Ian also showed how to make a backup user account to use in case of problems, and how to select a picture or use one from your camera as an icon to go with the new user. Set the backup user account to “Allow user to administer computer”. #15. If you often share your Mac with someone else, enable Fast User Switching. #16. Set up filters in Eudora to sort mail into mailboxes when it arrives, and set up Eudora’s self-learning spam filter. To sort messages already received, highlight messages to sort, then select “Filter Messages”. 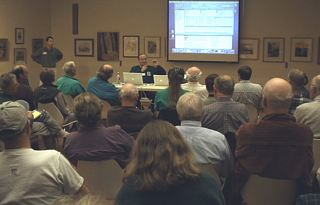 February 17, 2005: At the end of the Q&A session, Dirk Reynolds showed us new archiving software called Delicious Library. After refreshments, the presentation was iWork, focusing on Pages, the new word-processing software from Apple. Drawing prizes were a copy of iWork, donated by the MacMechanic store, and products from the Apple company store in Cupertino. We had a good turnout on a rainy night. Dirk Reynolds showed Delicious Library and iWork. January 20, 2005: Our annual report of the Macworld convention in San Francisco. Dirk Reynolds gave a slide show and review of new Apple products and Apple news. Dirk also described Tiger (Mac OS X 10.4), saying it was to be released in the first half of 2005. Mike Bishop of the MacMechanic store gave us a slide show and description of the Macworld convention, and pictures of the Apple store in San Francisco. The drawing prize was a new iPod Shuffle. Can you find the Mac Mini or the iPod Shuffle?